Apple scab is a cryptogamic disease that attacks trees (mainly apple and pear trees, but also plum and olive trees). This disease is caused by a fungus (which is a cryptogamic organism, which is where the illness gets its name from). In man the equivalent disease is called mycosis. To attack the plant the fungus enters through the stomata or lesions on the leaf or fruit (often caused by insects). The disease causes brown spots on the leaves and fruit. The fruit can also become deformed. 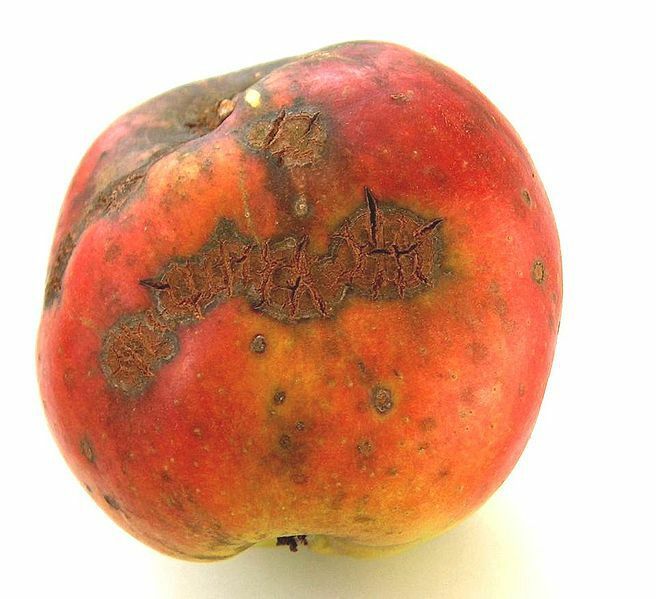 The fungus that causes apple scab is Venturia inaequalis while Venturia pirina is the fungus that attacks pear trees. Both are ascomycete fungi.